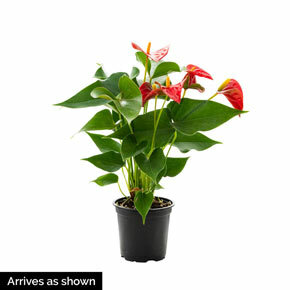 Flowering Date Anthurium bloom year round when cared for properly. 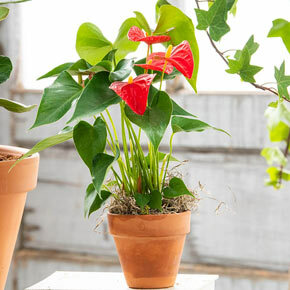 Flowering Date: Anthurium bloom year round when cared for properly. 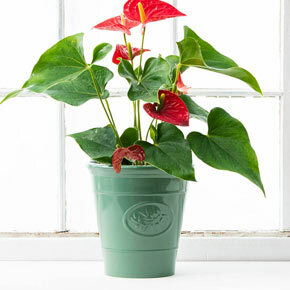 Winter Care: Sharply reduce watering frequency as the anthurium will be dormant for about 2 months. Keep the plant warm during the winter. It will not tolerate colder temperatures. Flower Form: The flower's spathe looks like one of it's normal leaves but colored red. Extending out of the middle of the spathe is the central spike. Foliage Type: Broad, shiny, green leaves. Pruning: Prune away discolored and dead leaves as necessary. Cut wilted blooms back to the base of the stem. Soil Requirement: Keep the soil damp, but do not drench the soil. Anthurium do not like continually moist soil and its growth rate will slow down. Watering Requirement: Water when the soil is dry to the touch. Drowning the soil will cause root rot and kill the anthurium. Additional Information: Mildly to moderately toxic to pets and humans. Wash hands after handling an anthurium.